I’ve long admired you from afar. Brief glimpses and fleeting encounters were all we had. I thought the intrigue may be mutual as our encounters became more frequent, and then longer. I was pleased to be present as you tended your new offspring, and then other intimate family moments. I strived to be respectful and supportive. But you turned on me. I tried to give you space when it became increasingly clear that my presence made you uncomfortable. There was the one day that we had a long one-on-one and I was hopeful for a fresh start. You had seemed so calm and understanding, but our relationship was soon to deteriorate. The next time we crossed paths, you charged me from afar. I felt targeted but gave you the benefit of the doubt – hopeful that we might forgive and forget. That’s over though. You ambushed me. I didn’t even know you were in the area when you tried to strike from behind. That alone I may have forgiven, but you proceeded to scream at me, taking one pass after another while missing only by a narrowing margin. I suspect you would have struck had I not held my ground, playing nonchalant while discreetly shielding myself. My heart was pounding and I was unsure how to deescalate our situation. I think you would have continued until you ripped my flesh had not innocent by-passers come to my rescue. It pains me to say this and it is not by my choice, but I believe our relationship has dissolved. We are now, officially, enemies. It all started in 2009 when I began taking photos for my recently released Birds of Fairchild book. I was relatively new to both wildlife photography and birds, but had spent a lifetime stalking nature. I had spent many an hour quietly observing wildlife and my quarry nearly always seemed aware that I meant them no harm. There are now two glaring exceptions to this generality. First, my pet rhinoceros iguana who vehemently hates me – and me alone as she’s quite pleased to be petted by most anyone else. When I approach, however, she wakes from dead sleep to hiss and misses no opportunity to lunge at my jugular. That’s an entirely different story though. The second is my Frienemy. 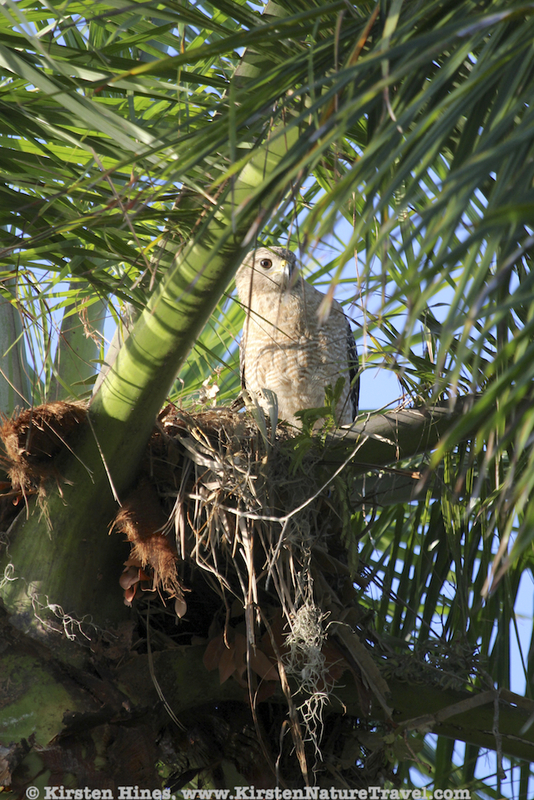 There’s a pair of Red-shouldered Hawks that claim Fairchild Tropical Botanic Garden’s vast plantings and lowland lakes as home. When I started tracking birds through the garden, I would hear the hawks call in the distance and very occasionally catch a glimpse of one in flight. I felt fortunate when, after many months and days of wandering, I stumbled upon the two young of the year and they stayed long enough for me to capture a few decent shots. I had a few more opportunities like this, eventually even a couple of close-up photo ops with the adults. In 2012, I felt fortunate to have stumbled upon the resident Red-shouldered Hawk’s nest. The hawks weren’t particularly discreet that year, choosing a tall royal palm just off the garden amphitheater on a peninsula jutting out into a lake. There were constantly people nearby and the day I discovered them a team of gardeners were working in the lake below. The new parents seemed oblivious to the people and the work, paying it no heed one way or another. I could hear a chick calling and given the frequent parental trips to and from the nest, I thought I might be able to photograph the feeding. Thinking the birds didn’t care, I set up in the glade below the nest and began taking pictures. I was ignored for a time, but then a parent began calling from nearby trees and its frequent flights began veering in my direction. Eventually there was no misinterpreting – I was being swooped. I tried taking photos as the bird bore down on me, but it was happening too quickly for the camera to focus and I felt the need to dodge out of the way for fear I’d actually be hit. It didn’t take long to realize that I was disturbing the nest, and that was certainly not my goal. I quietly departed. A few days later I returned. I could tell from a distance that the parents were away from the nest, so took the opportunity to hide among bushes nearby. I found a gap just big enough for my lens that provided a more-or-less direct view of the nest without exposing me and waited. Shrieks and peeps alerted me when the next feeding began. I struggled for shots, but my lens view proved less direct than I had anticipated. As I incrementally repositioned, keeping hidden and trying not to disturb the birds, I heard a change in the adult call. Moments later an angry parent dove from the nest straight in my direction. Surely this was a coincidence, wasn’t I hidden? The feathered fury swooped in my direction again. Not a coincidence. I apologized mentally as I backed out of the bush, to be greeted by yet another swoop on the other side. The message was very clear message – I was not welcome in the area, not even inconspicuously. I wanted to send a clear message back that I would bother them no longer, so turned and began walking away. A swooshing sound alerted me to another charge, but this time I nearly fell to my knees as I felt the full impact of the attack. It felt like I’d been hit by a semi-truck. My head throbbed and I staggered unsteadily away. A pair of bloody cross marks on my scalp confirmed where the talons had struck and I spent the rest of the day dizzy, likely suffering from a minor concussion. I never returned to the nest that year. But apparently damage to the relationship was already done. The hawks avoided me for about a year, providing me with nothing more than an occasional screech from above and never more than a parting view. And then I stumbled upon one of the pair hidden in a tree at the back of the Garden. I was actually positioning for a shot of Turkey Vultures when I noticed the hawk watching me from not far away. We were so close and the hawk seemed unfazed by my presence. So I repositioned and spent a good half an hour or so photographing the hawk instead. It eyed me occasionally, but generally ignored me and its departure seemed linked to a disturbance in the bushes beyond and not me. I was hopeful that our days as enemies were over. I was wrong. My next good sighting was of the female resting on Fairchild’s osprey platform. I was on a vegetated hill across the water with clear views, but I simply observed passively as there was nothing particularly exciting or aesthetic about the scene and it was too far for portrait shots. And then the male arrived. There was a brief courtship display with both birds fussing and flapping, and then he hopped onto her back. I lifted my camera as he balanced with outstretched wings, seemingly focused solely on his mate. As I hit the shutter though, the male’s head snapped toward me, the tone of his call changed and within milliseconds the view through my lens morphed from one of romance to one of hatred. I held my camera in place and uncertainly stood my ground as the fierce face in my viewfinder charged ever closer. Wind against my cheek suggested the proximity of his last second swerve and I whirled around to face my attacker, unwilling to offer the back of my head again. The bird shrieked at me several more moments as I nervously forced myself to move in for a better angle. He would have none of it. He turned and leapt rapidly into the air and out of sight. The whole episode left me stunned. Did the hawk remember me? I was decently far from the mating and, really? Attacking me was worth abandoning a session in the sack? Hadn’t we made peace at our last meeting? I was baffled, amazed and somewhat offended by all of it. What really had I done to evoke this level of animosity? Apparently a lot because a few weeks later was an incident that sealed the deal on continued enmity. I was wandering the Garden, desperate for a cover shot for the book, just not finding the right scene, or even the right bird for that matter. I decided to check a spot along the Lowlands Loop of the Bird Trail along the back edge of the garden where there is inevitably an attractive cormorant languidly sunning itself in a mangrove clearing. I walked nonchalantly, camera down at my side, slowing as I neared my destination so as not to disturb my potential subject. Suddenly I heard a familiar swooshing sound. I turned and ducked just as the hawk stretched its talons toward where my head had been mere instants before. It veered into the buttonwood tree beside me and whirled around screaming, glaring down at me intently. There was no doubt that despite my unusual hair down look (normally in a pony tail), cold weather attire and a brand new camera bag, the hawk still recognized me. I sidled to a nearby bench below a buttonwood and eased down, eyes alertly on my scolding former friend. I sank as low as possible for a good photographic angle on the bird but even more to cover my back and place wood between my scalp and those sharp claws that clung to the branch above me. The bird leaped in my direction and I lifted my camera as a shield, firing off shots that captured blurry leaves and streaked sky. The hawk was at a distance to my left now, facing me fiercely again from a different tree. I eyed the vast lawn between us that was my only real escape, a very unprotected route that provided perfect striking opportunities. Another loud shriek and the hawk rapidly spanned the distance, narrowly missing me as it returned to its perch just feet above. My heart pounded as I struggled to hold my camera steady. I was not about to show weakness. If I were being held hostage by a hawk, I was determined to at least get some good photos out of it. As dive bomb after dive bomb got closer and more frequent and my photos no less blurry, I began to second guess my strategy. I continued my charade of bravery as I uncourageously contemplated exit options. Surely the hawk would tire of this eventually…. my thoughts were cut short by an exceptionally close call. Or maybe he wouldn’t. The unwavering glower suggested otherwise. I darted my eyes back to the hawk as I sensed and confirmed another attack, lifting my camera just in time to dissuade a direct hit. “It almost looks like it’s trying to hit you!” the man continued. “He is!” I confirmed, now keeping my eyes on the hawk. The hawk came again, a little less closely and alighted further away and deeper into the buttonwood’s foliage. The hawk hopped to an even higher branch as the man spoke again. This was my opportunity. I rose slowly, full attention on the hawk who was still eyeing me acutely despite the growing distance. I backed across the lawn, eyes fixed on the vengeful bird as I chatted lightheartedly with the observing couple. The closer I got to the visitors, the less engaged my attacker became. The hawk was still in the area though when my conversation drew to a close. No longer feeling comfortable, and convinced there must be a nest somewhere nearby, I immediately scurried out of the line of vision and as far from the site as possible. I confess to nervously peering behind me more than a few times as I fled to the more crowded part of the Garden. And even there, my heart dropped when I heard the calls of my aggressor and then looked up to see him soaring above. There was no ensuing attack, but by the third time this happened I was sure I was being stalked and lost all semblance of concentration. It was time to leave. Thus, I have officially become the enemy of the Red-Shouldered Hawks at Fairchild. The question is though, now that the book is out and I can wander the grounds again without my heavy lens, is it truly me that the hawk hates? Or might I blame my camera? Or maybe it doesn’t matter. Maybe the hawks will be so pleased to learn of their published family portraits that all will be forgiven. 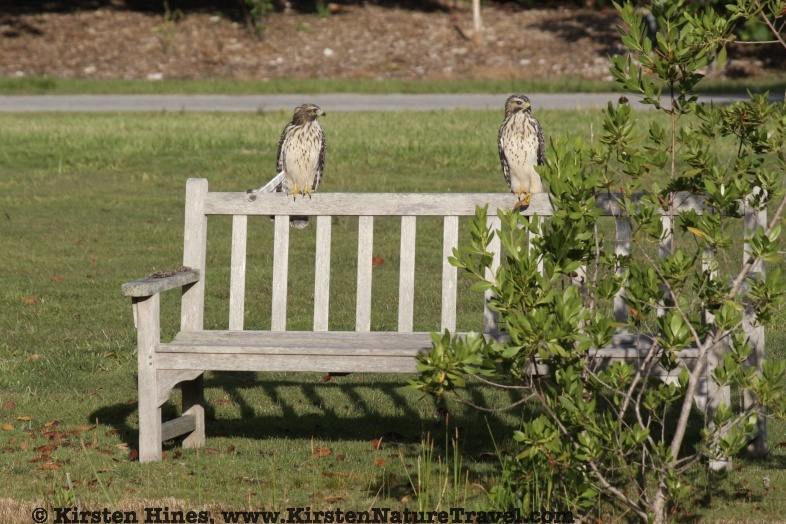 My encounters with the Red-shouldered Hawks at Fairchild Tropical Botanic Garden were part of the process of collecting images for my recently released Birds of Fairchild book. My goal was to capture natural, uninfluenced interactions between Fairchild’s birds, other wildlife, and plants in the Garden. Despite my attempts at discretion, I obviously failed at going unnoticed where the hawks were concerned. The Birds of Fairchild book aims to inspire South Floridians to view gardens in a more wildlife-friendly light. It’s companion Bird Trail Guide leads Fairchild visitors to the garden’s more birdy areas and points out various wildlife-attracting features of Fairchild. These books are the inspiration, and my Attracting Birds to South Florida Gardensbook, is the informational guide on how to create bird-friendly gardens in sub-tropical South Florida. The eventual goal of all of these books is the re-greening of South Florida where much of our upland habitat has been lost to development. Please help restore and maintain the region’s ecological functioning by gardening in ecological, naturalistic and diverse ways and by spreading the word! The above hawk image and others in my South Florida Birds & Gardens collection are now available for purchase as Prints. For more information about upcoming author events and gallery shows, please check out my Events page.